Preston North End edged closer to the Championship play-off places as they came from behind to beat 10-man QPR. The visitors started the stronger and Kazenga Lua Lua had two efforts saved by Chris Maxwell before back-heeling his side ahead late in the first half. But the lead was short-lived as Aiden McGeady's long-range strike levelled the score right before the break. And Jordan Hugill slotted the home side ahead before QPR's Luke Freeman was sent off for a second yellow card. The Lilywhites are now eighth in the Championship table, six points behind Sheffield Wednesday in sixth. 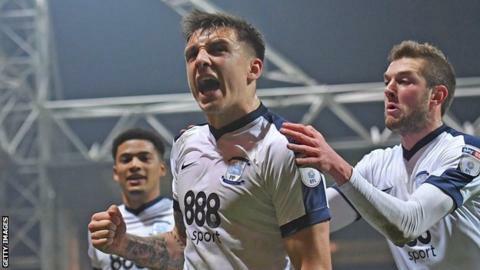 Preston went into the match having lost just once in their last 10 games but they were forced onto the back foot early on, with keeper Maxwell forced to deny both Pawel Wszolek and Lua Lua twice in the opening half hour. But Lua Lua's persistence paid off when he finally beat Maxwell with a brilliant back-heel from close range. QPR's lead lasted less than 10 minutes, however, as McGeady equalised with a long-range strike with virtually the last kick of the first half. Preston began to assert themselves after the break and deservedly took the lead when Hugill scored with a right-footed shot from close range following a corner. Rangers remain 16th in the table, nine points clear of the relegation places. "It was a disappointing goal to give away. A long throw into the box, unfortunately it just went through Tommy Spurr's legs and to be fair the lad showed great awareness and good skill to put it in there. "We ultimately responded well and when you've got somebody like McGeady who can do something out of nothing, it just shows the quality that the lad's got. "Hugill got into some good areas and unfortunately didn't hit the back of the net but, for the winner, he reacted really well to lose his man and getting the first ball." "I know Luke Freeman and I don't think he put any weight on it. He's tried to ride the tackle and not hurt anybody. "Apparently the ref didn't see it, the linesmen didn't see it and the fourth official's made an absolutely outrageous call and said it's a second yellow. "If it's a stamping and it's a deliberate stamping which he clearly says he saw, why isn't that a direct red which we might be able to appeal?" Match ends, Preston North End 2, Queens Park Rangers 1. Second Half ends, Preston North End 2, Queens Park Rangers 1. Attempt blocked. Aiden McGeady (Preston North End) right footed shot from outside the box is blocked. Attempt saved. Tom Barkhuizen (Preston North End) left footed shot from the centre of the box is saved in the top right corner. Assisted by Aiden McGeady. Attempt missed. Joel Lynch (Queens Park Rangers) left footed shot from outside the box is close, but misses to the right. Corner, Preston North End. Conceded by Joel Lynch. Corner, Preston North End. Conceded by Alex Smithies. Attempt saved. Tom Barkhuizen (Preston North End) left footed shot from the right side of the box is saved in the top left corner. Assisted by Alan Browne. Attempt saved. Jordan Hugill (Preston North End) right footed shot from the centre of the box is saved in the centre of the goal. Assisted by Tom Barkhuizen with a headed pass. Substitution, Preston North End. Tom Barkhuizen replaces Daryl Horgan. Attempt missed. Yeni N'Gbakoto (Queens Park Rangers) right footed shot from the centre of the box is too high. Attempt missed. Aiden McGeady (Preston North End) left footed shot from the left side of the box is close, but misses to the left. Assisted by Daniel Johnson. Corner, Queens Park Rangers. Conceded by Daryl Horgan. Second yellow card to Luke Freeman (Queens Park Rangers) for a bad foul. Thomas Spurr (Preston North End) wins a free kick in the defensive half. Attempt missed. Jordan Hugill (Preston North End) left footed shot from very close range is close, but misses the top left corner. Assisted by Callum Robinson with a cross. Substitution, Queens Park Rangers. Jamie Mackie replaces Kazenga Lua Lua. Goal! Preston North End 2, Queens Park Rangers 1. Jordan Hugill (Preston North End) right footed shot from very close range to the high centre of the goal following a corner. Attempt saved. Jordan Hugill (Preston North End) left footed shot from the centre of the box is saved in the bottom left corner. Assisted by Daryl Horgan with a cross. Corner, Preston North End. Conceded by Pawel Wszolek. Attempt blocked. Thomas Spurr (Preston North End) left footed shot from outside the box is blocked. Assisted by Daryl Horgan. Substitution, Queens Park Rangers. Yeni N'Gbakoto replaces Darnell Furlong. Tom Clarke (Preston North End) is shown the yellow card for a bad foul. Ryan Manning (Queens Park Rangers) wins a free kick on the right wing. Attempt missed. Greg Cunningham (Preston North End) right footed shot from the centre of the box misses to the left. Assisted by Jordan Hugill. Attempt blocked. Greg Cunningham (Preston North End) left footed shot from the right side of the box is blocked. Assisted by Daniel Johnson with a cross. Kazenga Lua Lua (Queens Park Rangers) is shown the yellow card for a bad foul. Foul by Kazenga Lua Lua (Queens Park Rangers). Corner, Preston North End. Conceded by Nedum Onuoha.